Most people associate The Blitz with World War Two, but the first airborne terror campaign in Britain took place during the First World War. 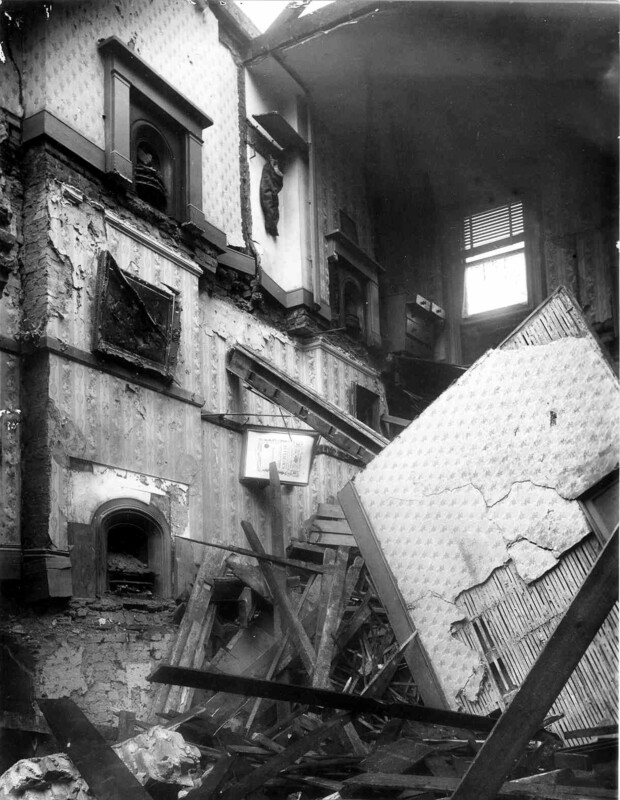 Air raids in World War One made significant damage and took many lives. German raids on Britain, for example, caused 1,413 deaths 3,409 injuries. Air raids provided an unprecedented means of striking at resources vital to the enemy's war effort. Many of the novel features of the war in the air between 1914 and 1918 - the lighting restrictions and blackouts, the air raid warnings and the improvised shelters - became central aspects of the Second World War less than 30 years later. 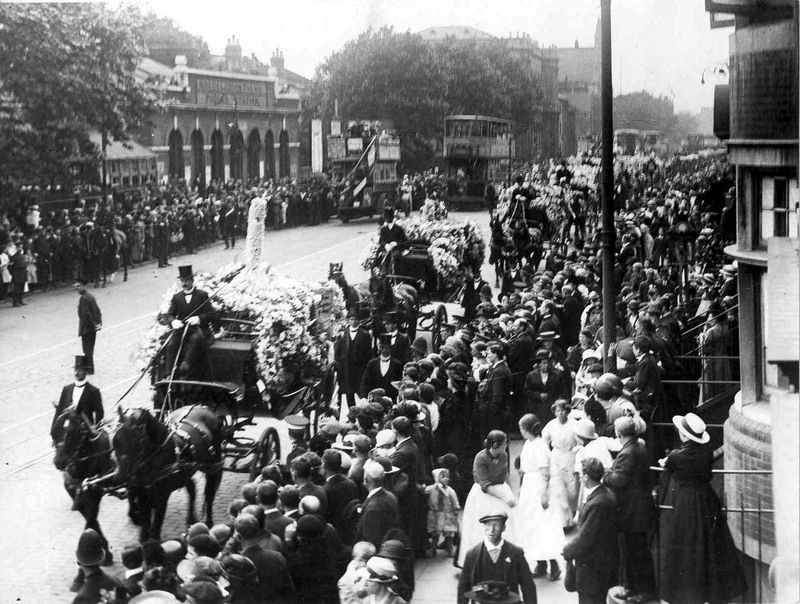 The East End of London was one of the most targeted places. 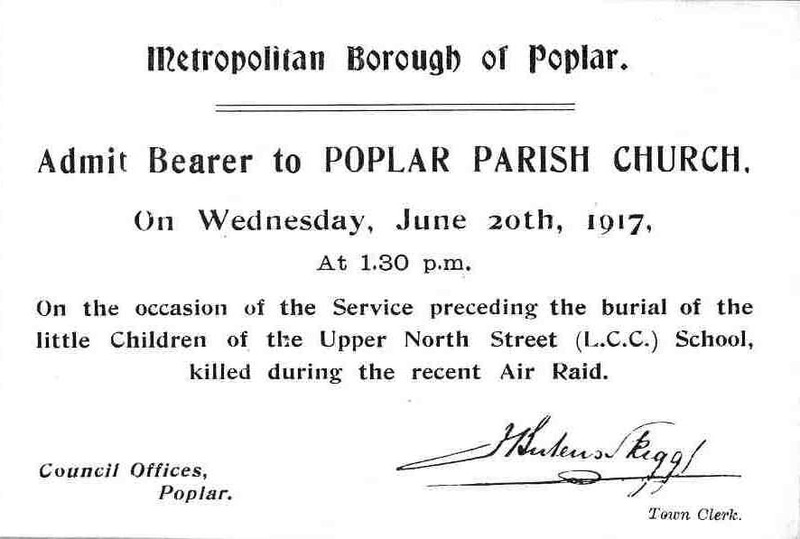 Poplar, in particular, was struck badly by some of the air raids during the First World War. Initially these were at night by Zeppelins which bombed the area indiscriminately, leading to the death of innocent civilians. The first daylight bombing attack on London by a fixed-wing aircraft took place on 13 June, 1917. Fourteen Gothas led by Squadron Commander Hauptmann Ernst Brandenberg flew over Essex and began dropping their bombs. It was a clear day and the bombs were dropped just before noon. 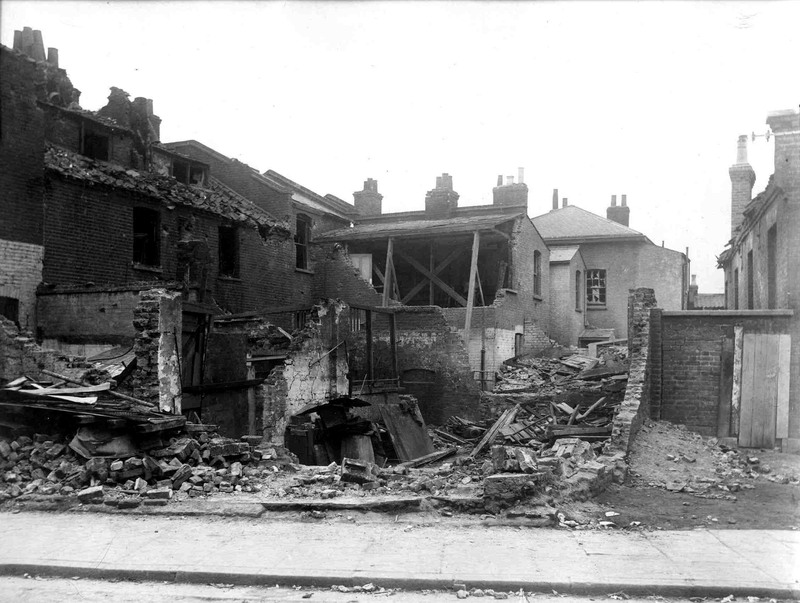 Numerous bombs fell in rapid succession in various districts in the East End. 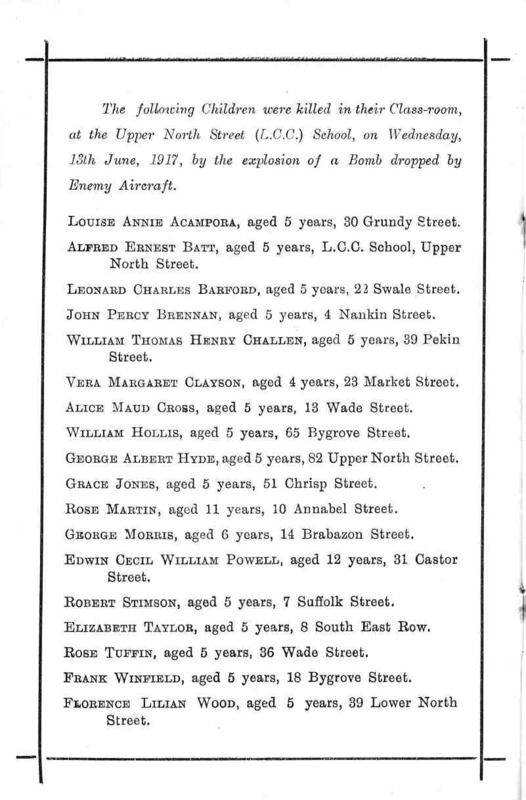 In the East End alone; 104 people were killed, 154 seriously injured and 269 slightly injured. 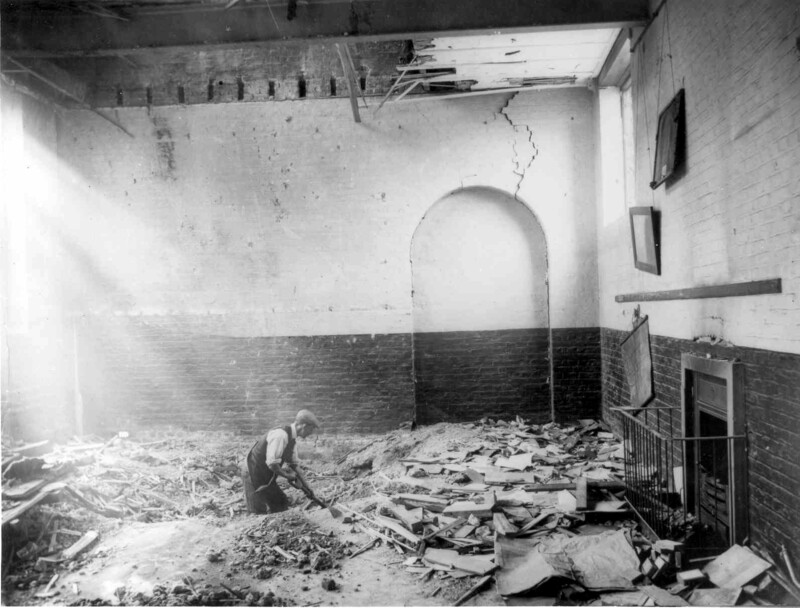 The gravest of incidents that day, was the damage done to a Council school in Poplar. In the Upper North Street School at the time were a girl's class on the top floor, a boy's class on the middle floor and an infant class of about 50 students on the ground floor. 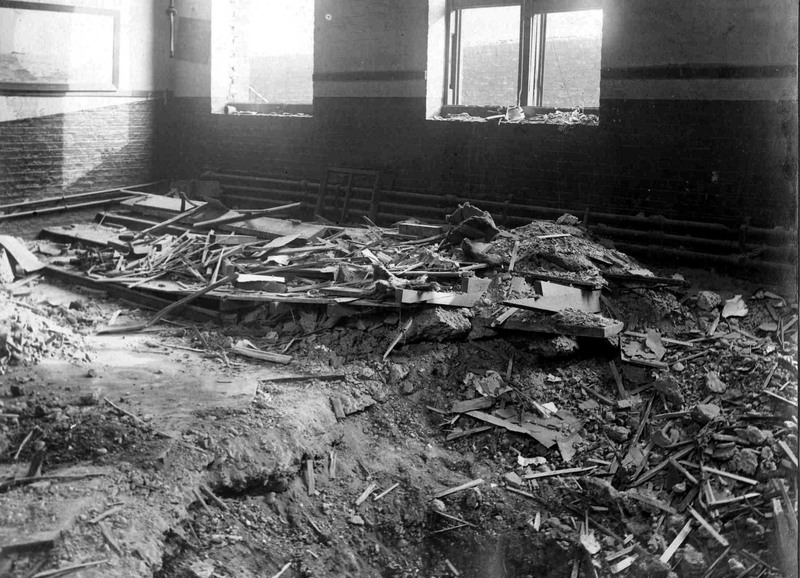 The bomb fell through the roof into the girl's class; it then proceeded to fall through the boy's classroom before finally exploding in the infant class. Eighteen students were killed overall. Sixteen of these were aged from 4 to 6 years old. The two teachers of the infant class acted like heroines as they got everyone out of the building before helping others who were rescuing bodies from the rubble. Panicked mothers searched for their children, desperately hoping they were not one of those caught in the blast. As quickly as possible, the bodies of the children who were killed were removed to the mortuary, and the injured were cared for by nurses and surgeons and taken to the hospitals. 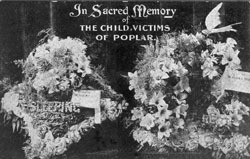 The mayor of Poplar at the time, Mr. Will Crooks, expressed his grave sorrow for those affected by the bombing; he said that the children had truly suffered for their country. 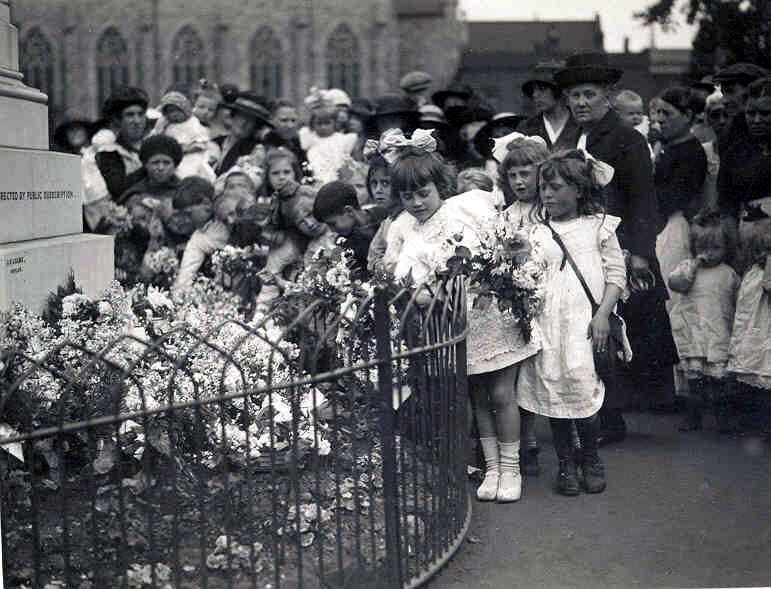 About a week later, one of the biggest funerals in London was held for these infants. It was a sad day. 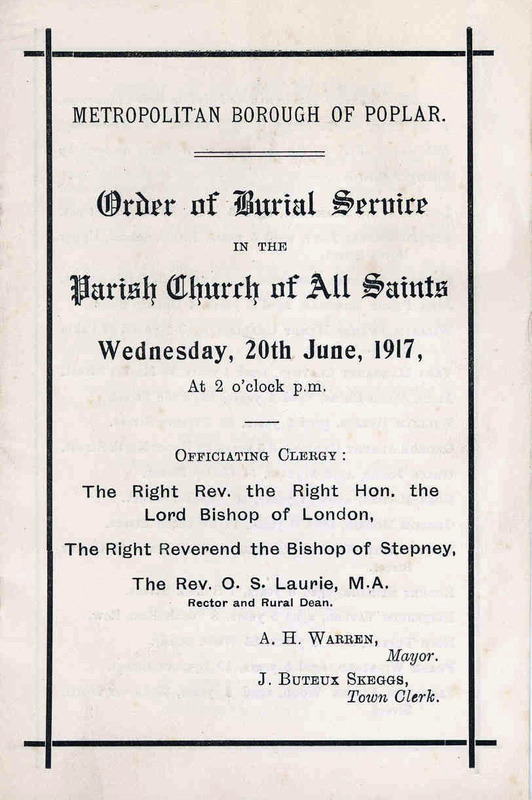 Fifteen children were buried in a mass grave at the East London Cemetery, while the other three children had private graves. 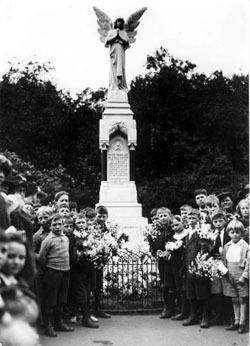 Brothers and sisters of the children looked on with mournful faces, some having also been in the school at the time of the bombing. 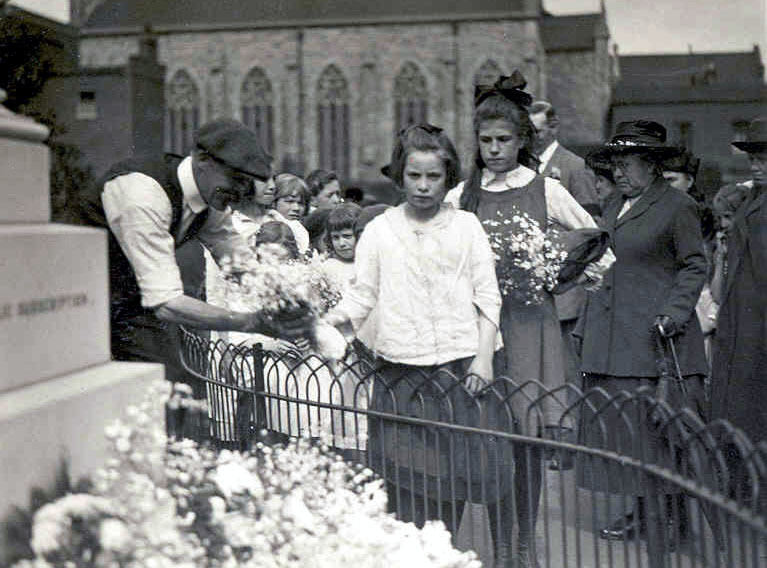 A memorial in Poplar Recreation Ground, unveiled in June 1919, bears the names of the 18 Upper North Street School pupils that were killed on the first daylight air-raid on London.